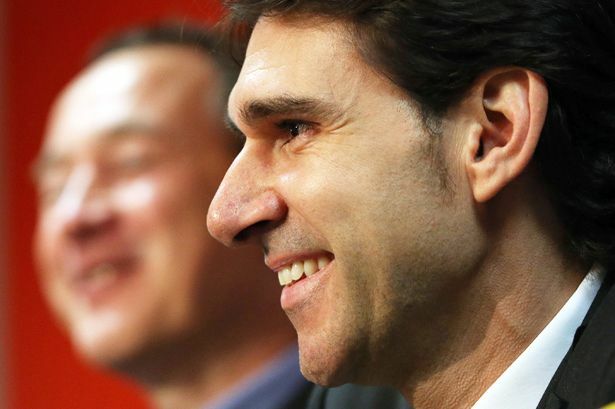 Aitor Karanka says he is still finding out about the players he has inherited at Middlesbrough. Boro’s new boss has yet to discover his best starting XI, but insists he is getting to know his squad better by the day as he prepares for what will be his fourth game at the helm as the Teessiders take on Birmingham City at St Andrew’s this afternoon. Karanka said: “It’s my most difficult work, choosing who will be the first 18 and after that who will be the 11 who play. But it’s my job and I’m very happy to have this problem rather than sitting in my office with only 12 or 13 players to choose from. I have 26 players ready to play and it’s a hard decision but I’m happy to have this situation. Karanka has had to make changes in each of his games so far, and will again be forced to alter his line-up this afternoon. Defender Curtis Main is suspended after being sent off in Boro’s midweek defeat at Derby County, while Jonathan Woodgate and George Friend both picked up injuries in the same game. “Maino’s problem was he put in everything on the pitch to show me he was ready to be in the team,” said Karanka. Goalkeeper Jason Steele will again be missing as he serves the final game of a three-match ban, but midfielder Grant Leadbitter is available again after missing the Derby game through suspension. Karanka’s only win since taking charge saw Boro beat Bolton last weekend, when Leadbitter’s penalty proved decisive. The Spaniard has seen his team lose at Leeds United and Derby, but is hoping the trip to St Andrew’s proves more profitable. “At Leeds I didn’t know the players like I do now,” he said. “We’ve been working together for three weeks and on Wednesday I watched a team who were very, very compact playing against a Derby team who play very good football but didn’t give our goalkeeper a lot of problems. “I’ve said from the first day, this is a long distance race and the club and supporters and everyone need to be together. “I prepare for every game as the most important game. “I don’t think if we win on Saturday that we will be thinking about the play-offs and I don’t think that if we lose we will be thinking about the bottom positions. We’re always thinking about the next game. It’s a very close league. Boro and Birmingham are two of four clubs locked together on 19 points, with the Teessiders top of that group on goal difference while the Blues are right behind them. Karanka expects another difficult test, and is especially wary of Birmingham’s Serbian striker Nikola Zigic. He said: “I know Nikola Zigic because he played in Spain and he’s a very good player. “But there are a lot of similarities between Birmingham, Derby, Bolton and a lot of teams in this division. Birmingham manager Lee Clark was in the stands at Pride Park on Wednesday to do some homework on Boro. “I was at Derby on Wednesday night to watch them,” said the former Newcastle United and Sunderland midfielder. “They were very well-organised and even when they went down to 10 men Derby found it difficult to break them down. “They’ve got an extremely experienced and calm character in goal, who I know very well from playing alongside him – Shay Given.